Freshly Made Sketches: Winners For Sketch 227! The Clean Team has chosen the Princesses for you this week and our hostess Linda has chosen the Queen! I had a grand time visiting all of your sites and checking out your amazing creations! It was a great gallery this week - hard to pick my favorite! Lori's card is clean and simple perfection! 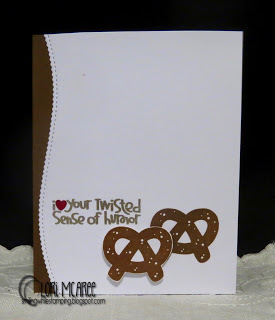 The sentiment and pretzels are perfect together! I also love her finishing touches like the tiny heart and the marvelous curved edge! This just makes me smile! Congratulations, Lori, you are the Queen of Clean! Please come back tomorrow for a new sketch from Kim! Thanks so much Jen, for choosing my card! Congrats to the Queen and the other winners! Thanks Kim!!! Congrats to all the winners!!! Thank you SO much Linda for choosing my card!! Congratulations to all the winners!! Freshly Made Sketches #230 - A Sketch by Jen B. There's Still Time to Play With Sketch 229! Freshly Made Sketches #229 - A Sketch by Cindy H.
There's Still Time to Play With Sketch 228! There's Still Time to Play With Sketch 227! There's Still Time to Play With Sketch 226!